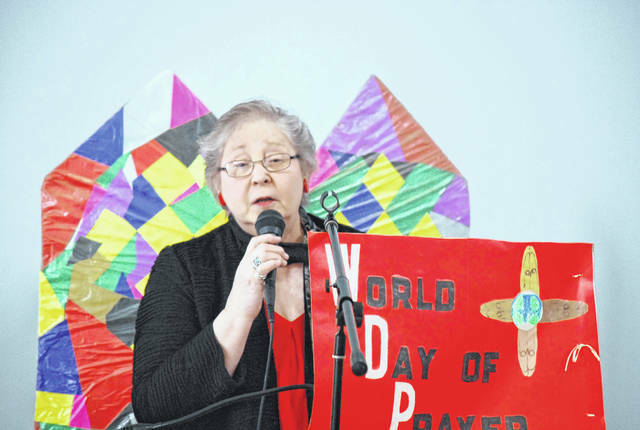 Bobbie Higgins, president of the Lima chapter of Church Women United, kicked off the organization’s annual celebration of the World Day of Prayer Friday at South Side Christian Church. The nation of Slovenia was the host nation for this year’s event. LIMA — With Slovenia serving as the host country for the international World Day of Prayer 2019, members of the Lima-based Church Women United organization on Friday read aloud excerpts of life experiences shared by woman of that former Communist country. The annual Allen County service was held at the South Side Christian Church. Bobbie Higgins, president of the Lima chapter of Church Women United, said the non-denominational, faith-based organization has existed locally for more than 100 years. More than a dozen women gathered to mark the World Day of Prayer celebration held annually throughout the world on the first Friday of March. This year’s host, Slovenia, is a country of 2 million inhabitants located in Central Europe that declared its independence from Yugoslavia in 1991. Not surprisingly, the challenges and obstacles facing Slovenian women in many cases closely mirror those of residents in other parts of the world, according to messages relayed during Friday’s ceremony. And, in accordance with the founding principals of the World Day of Prayer, the answer to many of those challenges lies in the word of Jesus Christ. Older women from that county who helped prepare the program for the World Day of Prayer talked about the struggles of their youth, living as second-class citizens in the former Communist land. Others who grew up in a free Slovenia talked about increased economic and educational opportunities available to them, but nonetheless described family struggles with alcoholism, bullying of their children in school and social exclusion in a class society. “Merciful God, forgive us when we silence ourselves in face of injustices,” one Slovenian woman wrote. “Loving God, employ us to reach out to people of all generations and show our gratitude to those who have gone before,” said another.